The FIPJP Congress in Madagascar approved the adoption of new Rules from 1 January 2017. PNZ has published a New Zealand version which incorporates the Interpretations issued last year. The appropriate pages under Umpiring will be updated shortly. In the meantime a copy of the NZ Rules and Interpretations (1Mb) is available for download. The weight of the cochonnet must be between 10 and 18 grams. The team winning the toss or the previous end will have only one attempt to throw a valid jack (instead of 3). If the throw is not valid, the opponent must place (not throw) it at a valid position on the piste. If a player picks up the circle when there are boules still to be played, the circle is replaced but only the opponents are allowed to play their boules (if any). If a player picks up their boules from the playing area while their partner(s) have boules remaining, they will not be allowed to play them. Flattening/sweeping the ground in front of a boule to be shot is explicitly prohibited (with penalties). A yellow card for exceeding the time limit will be imposed on all the players of the offending team. If one of these players has already been given a yellow card, they will be penalised by disqualification of the boule played or to be played. Eighteen teams have entered the Khandallah Mixed Doubles on Saturday, 14 January. A full field being greeted by Club Captain Ted Burr. Blessed with magnificent weather, a field of sixty-four players took part in the annual New Year Mêlée at the Otaki Pétanque club. A great day was had by all to kick off the New Year. Ted Burr and Doc Murray. Congratulations to all the winners, and thanks to everyone who took part. Report and photos: Ann Hogg. Players in the Khandallah Mixed Doubles. The largest entry since 2010 saw eighteen teams take part in the Khandallah Mixed Doubles. After 3 rounds of qualifying, three teams Barbara Nicholls & Brian Smith, Kathy Gatford & Tony Gatford and Alan Cameron & Trish Smart were undefeated. They were joined in the Trophy section by defending champions Kath Alison & Michael Rocks who qualified fourth on points differential. Barbara & Brian and Kathy & Tony both won their semi-finals and so faced off for the Mixed Doubles title. In a close match, Barabara & Brian prevailled 13-11. The Plate section was won by Wayne Green & Betty Jackson over Jack & Linda Gazzard. The Bowl was claimed by Moises Burgos & Colleen Horton who beat Ian Bailey & Pauline Foxall. Paul Bonsey & Lynley Watt beat Brian Frampton & Lynne Shepherd to win the Cup, and the Spoon was won by Adrienne & Dave Gwerder who beat John Clarke & Betty Wilmshurst. Thirty-six teams have entered the Kapiti Open Doubles this weekend (21-22 January). 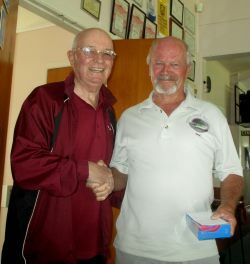 Thirty-three teams took part in the 17th annual Kapiti Open Doubles played over Wellington Anniversary Weekend. Saturday’s qualifying featured the usual 5-round snake format. As the first major event of the New Year, this was the first experience many players had of the new FIPJP rules. Two teams, Morgan Choveaux & Nico Toyne and Tony Chin & Ants Yee, both won all five games to head the qualifying standings. A Tir de Précision (Shooting Competition) was added this year and the two top qualifiers were Michael Rocks and Nico Toyne. Unfortunately, Sunday’s weather was wet and at times very windy. With so many puddles on the terrain, the synthetic cochonnet (which are now banned due to their weight), were allowed again to reduce the incidence of floating cochonnet. The weather improved over the lunch break, which allowed the Shooting Competition to proceed in dry conditions. Michael beat Nico 22-6. In the afternoon, Morgan and Nico progressed through to the Trophy final, where they met the 2011 champions Maurice Belz and Sharon Cannon. Unfortunately, the rain returned for the final. Maurice & Sharon won the match 13-5 to claim their second title together. The Trophy Consolation was won by Myles Cowper and Michael Rocks, 13-9 winners over Christine Strichen and Claire Wilson. The Plate was won by Ann Hogg & Steve Frampton. The Bowl was won by Ernie Chu & Andrew Joe, while the Bowl Consolation was claimed by Anne Dawson & Margret Fleck. The video of the 2017 Kapiti Open Doubles is now on the Wellington Pétanque YouTube channel.